Kettlebells are perfect for overall body strength and conditioning, they will help you tone and build muscle, if used correctly. They are known to blast away body fat and even strengthen ligaments which lead to tougher joints and making yourself less prone to injuries. Kettlebells can be incorporated into a lot of fitness regimes and will make a huge difference to your body. They range in different sizes so there will be one ideal for all. Not only can you get different weight sizes, but you can also get kettlebells made from different materials. From soft outer shell to heavy cast-iron kettlebells. Here, we list the best kettlebells for home use, from the best adjustable kettlebells to the ideal home gym kettlebell set. With so many different exercises that can be performed using a kettlebell, you will sure see your body changing, no matter if you use light or heavy kettlebells. Maintaining form is essential when using any kind of weight, it will help to prevent injury and will promote muscle growth. This solid cast-iron kettlebell is ideal for home or gym use. 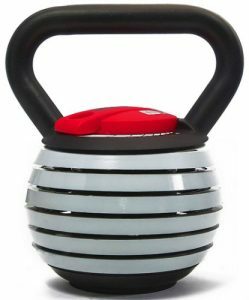 It features an easy-grip handle and has a hammertone finish to protect the kettlebell from wear. Perfect for toning muscles and building core strength. These kettlebells are sure to improve your workouts and outcomes. Available in a range of different weights, varying from 4kg – 24kg. 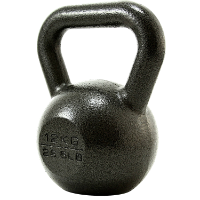 You can find this kettlebell here. 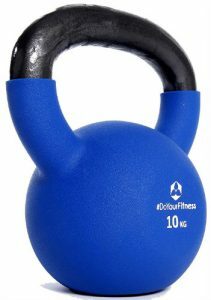 These #DoYourFitness kettlebells are made from 100% iron. They have a protective, coloured neoprene coating to ensure easy-cleaning and to protect the surface. Kettlebells challenge the body due to training with your hands, combining strength, endurance, cardiovascular, reflexes, mobility and speed and coordination. Improve all fitness components with these kettlebells. Available in a variety of weights from 2kg – 20kg, you are sure to find the ideal weight for you. Each different size weight has a different colour making it easy to distinguish which weight you are using. 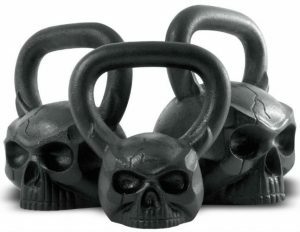 These skull design kettlebells are sleek and stylish. They feature an ergonomic handle for ease when holding. The flat base prevents rolling or slipping on the surface. Available in a range of size from 8kg – 32kg so there are plenty of options. Start with a lower weight and build a sleek collection of these kettlebone kettlebells. Check the price out here. This York kettlebell set is ideal for beginners. The set includes kettlebells weighted 2kg, 3kg and 4kg. 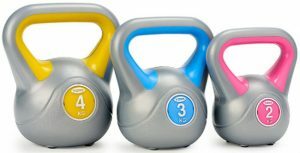 These are perfect for men or women and give you the chance to get used to exercising with kettlebells and to eventually use higher weighted kettlebells. The handle is easy-grip to help enhance your workouts and each kettlebell is colour coded for easy selection. The anti-slip base is an added extra and the vinyl casing will ensure these are long-lasting. These kettlebells also come with a wall chart to give you ideas of ways to use the kettlebells to work every part of your body. This Sportsplus adjustable, soft kettlebell comes with four weighing discs, meaning you can add or remove weight if desired. This is convenient for individuals who are not quite used to training with kettlebells as they can start from a low weight of 1kg and add more as they progress. The discs come in sizes: 1kg, 2kg, 3kg, and 4kg. The soft kettlebell reduces the risk of injury, especially compared to a cast-iron kettlebell, making these ideals for beginners. You can find this adjustable kettlebell here. This is a 7-piece adjustable kettlebell. Saving storage space and easy to change weight. The weights vary from 4.5kg – 18kg so you will easily be able to use this for a long time. This is ideal for all types of fitness levels. The metallic plates are long-lasting and hard-wearing. Push your body with this stylish adjustable kettlebell and reap in the results. 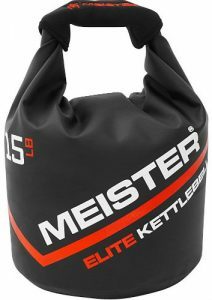 This Meister soft sand kettlebell is ideal for home-use or when travelling. It features a drybag seal to eliminate leaking sand and the outer is made from a heavy-duty, flexible PVC to ensure it is long lasting. With a comfortable neoprene hand grip, your hands are bound to be comfortable when exercising with this. The semi-rigid handles help with grip. The soft kettlebell eliminates the risk of injury to the body or damage to the surface. Check the price of this on Amazon. 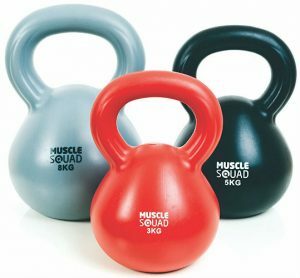 This Muscle Squad Kettlebell set includes 3 kettlebells weighing 3kg, 5kg and 8kg, making them ideal for a full body workout. They are ergonomically shaped to ensure you have a smooth feel when holding the kettlebell. They also have a modern, sleek look to them. They are easy to distinguish weight size by the different colours. Having 3 different sizes is perfect for when you gain strength and need to challenge your body more. 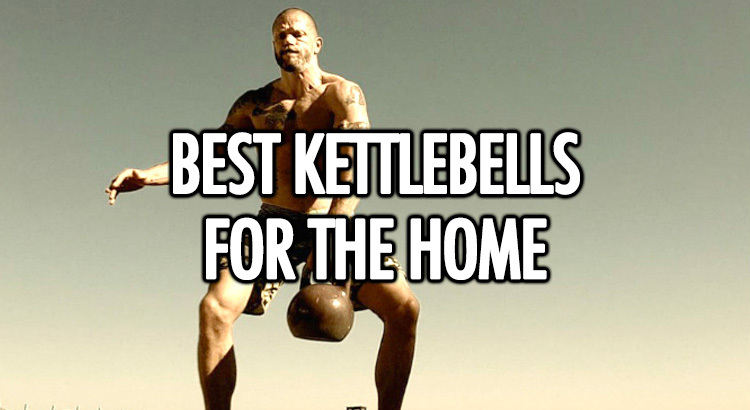 That completes our list of the best kettlebells. Improve your workouts and physique by adding a kettlebell to your routine. Build strength and muscle by incorporating a kettlebell and burn that stubborn fat.